From now until the end of August, all year-long ads on iBrattleboro are half price! That’s right, a one-time chance to be featured for an entire 12 month year, saving you five hundred dollars. 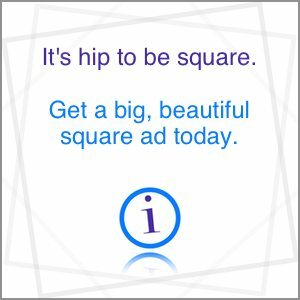 This is a big, color ad (300x300px) with a link to any web page you want, on a site that thousands check regularly to see what’s going on in Brattleboro and southern Vermont. You might wonder, have Chris and Lise lost their minds? Why so cheap? Your iBrattleboro ad is easy to start, cheaper than ever, and reaches people who are really interested in Brattleboro. Plus, and you have to trust us on this, you will be doing a good deed helping to battle dark forces! What other ad option offers you all of that? This ad sale only lasts until the end of August 2018. Act now and save big. As I type this, over 440 people were checking the site in the last 10 minutes(! ), looking for Brattleboro stuff. We get people who move to town using this as their getting started resource. It’s a great place to let people know your business/organization exists. These ads are the way we support the site, and are a great way for you to get local attention. We don’t use invasive ad services that track your every move. We don’t collect and sell your personal data to make extra cash for ourselves. We don’t have a paywall. We don’t limit you to 5 free articles a month. Your ad won’t compete with out-of-state ads. There are no annoying ads with movies, sounds, or other autoplaying features. We don’t pop up a screen over the news you are reading and ask for you to subscribe. There’s no cost to use the site and no requirement that you join to be able to read things here. You aren’t paying extra to support an ad sales staff here. We have no plans to harass you via sales reps.
We don’t kill trees to bring you the news, nor do we drive around polluting to deliver it to you. In other words, we spend a lot of effort making sure we don’t profit at all! Yes, we’re being bad capitalists. But that turns into great benefits to you, and we prefer it that way. If you like to support paywalls, tracking, and so on… buy your ads elsewhere. If you like local and free, we’re a great alternative. Two more days…. act now! I wish I had something to advertise! If you are the type to wait until the very last moment, this is the very last moment.